There are many traditional yoga exercises that are indicated for those interested in improving their willpower and overall mental strength. Many of these techniques work on the navel region, which is the location of the Manipura or Navel Chakra and is responsible for one’s willpower and strength of character. Here are some testimonials of how working on this center has helped readers develop their confidence and willpower – Yoga for Willpower and Self-Confidence Testimonials. You can easily search this website for sets and exercises that work on this region, by searching for abs, stomach or navel chakra. Also, here is a nice article which helps you determine the condition of each of your chakras and provides exercises and techniques to help balance the one’s that need work – How to Heal and Balance Your Chakras. So if you feel you need to improve your willpower, pick the techniques that help charge the Navel Chakra. I though have another recommendation for you if you are looking to build your willpower and inner strength, and that exercise is Yoga for Nerve Power. This exercise, as it’s name indicates, is actually for strengthening your nervous system, but I have found it very useful for increasing mental strength as well. As usual this technique will be added to our ongoing free online collections – Free Hatha Yoga Galleries and Free Kundalini Yoga Exercises. There you will find many of the poses which work on the abdominal region as well, but there is another great pose for building willpower which is part of the collection that I want to point out and that is Yoga Jesus Pose for Inner Strength. Jesus Pose is similar to Yoga for Nerve Power and I have found it equally beneficial for building and improving willpower. Both these poses come from the school of Kundalini Yoga. For students enrolled in the Online Yoga Teacher’s Training and Certification Program or Online Meditation Certification Program, typically this exercise is done at the end of a set, but you can work it into any yoga routine as well in a location that is sensible. 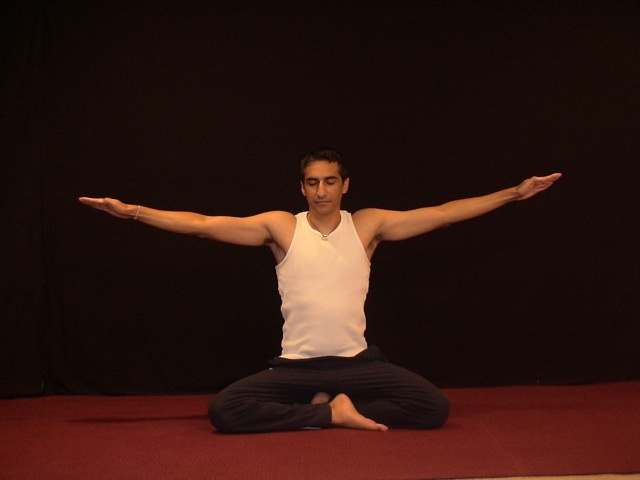 As it requires rapid arm movement, it is a good idea to stretch one’s shoulders and arms prior to doing this technique. Also, as this is a relatively easy movement to do, almost all students can practice it. The willpower building affect is related to how long one can keep this up for :-). Below you will find details of how to practice this pose, along with illustrations, step-by-step instructions, benefits and practice tips. Sit comfortably with your legs crossed. You can also sit up on your heels in rock pose if you prefer or on a chair. Next extend both arms out to the side keeping the elbows straight. The arm should be at shoulder level and your fingers are all extended as well. See illustration #1 above. Now begin to move your arms up six inches from parallel (Illustration #2) and down (Illustration #3) six inches from parallel. So you start with arms parallel to the floor and then move them up six inches and then down six inches. Continue to “flap” the arms in this way. The movement should be rapid and use the Breath of Fire throughout the exercise. You will notice that moving faster is actually easier that moving your arms slower. Willpower is like a muscle so when your shoulders start to hurt is when you have the opportunity to build this muscle, so DON’T STOP. Keep going and you will notice that as the muscles warm-up and pathways open up it will get easier. Remind yourself of all the good this exercise is doing for you, not just with regard to increasing your willpower, but also with regard to strengthening your nervous system. Use this as motivation to keep going. Once you are done, stretch your arms up and apply root lock three times. For the purpose of building willpower you need to push through the discomfort this exercise is going to create, so try to do 15-30 seconds more than is comfortable. Generally this exercise is done for 1, 3, 5, 7 or 11 minutes. Helps increase your willpower and mental fortitude. Helps strengthen your nervous system. Excellent exercise to strengthen and tone your shoulders. Be sure not to overstrain or overdo. Although the idea here is to build willpower by pushing past the point of pain and discomfort, you should be careful not to incur any injury. Concentrating on the Breath of Fire, it will help carry you through and help you go much further. There is a variation to the hand position which makes this exercise a little tougher, but is often used to enhance the effects. That is to have the thumb tip touching the base of the pinkie, while keeping the other 4 fingers extended. Try this hand position if you feel ready for the additional challenge. Another variation with the breathing you can use, if Breath of Fire is too much, is to inhale as the arms go up and exhale as the arms go down. Being able to sustain the exercise for extended periods of time will give you a great deal of confidence in your ability to handle the challenges life throws your way. It will make you mentally very tough and powerful. PS: If you enjoy this exercise or any other exercise on Mastery of Meditation and Yoga, please do share them with your friends. I appreciate your support.